Sparring partner(s) at home: John Bike, Chris Watkins, Mark Shelgren, John Robles, Vic Perez, Paul Godina, Marcos Chavez, Carlos Chavez, Armando Ortiz, Greg Ramirez, and all the LAAC boys. Most important win in a tournament and most satisfying win in a tournament: The next match after a win or a loss. They never stand out, but become a footnote to the past and I internally move onto the future. I guess I am blocking out all wins and losses on the same level these days. Perhaps avoiding satisfaction or complacency. How long have you been playing: 25 years, started at age 15, one my first National Open Doubles title with David Chapman at 18. Favorite handball tournament: Simple Green US Open, Anything attached to the Jake THE SNAKE Plummer Foundation, Hood River Open held every August in Hood River, Oregon. How will you prepare for the next one: Taking care of the body and getting more court time. Work schedule is making those two needed combinations lacking the right amount of time to complete properly. Favorite pro player: El Gato…. What is your best shot: Depends on the day, but the serve stands out the most. Who has inspired you to play this game at such a high level: My Father, Naty Alvarado Sr. Which current Race 4 Eight or top pro would you most like to play? Everyone is worth playing, I have no particular requests on this subject. Naty Alvarado continues to defy Father Time in his 4th decade. Alvarado had never lost before the semifinals in any Race start during the R48 I and II seasons before falling to Southern California rival Mando Ortiz at R48 III Stop #1 Plummer. Alvarado rebounded by advancing to the finals of the next event, the R48 III Stop #2 Simple Green U.S. Open. Alvarado carries himself and trains like a professional athlete while raising three beautiful daughters with his lovely wife Kerrie and working full time as a mortgage loan officer. Alvarado will be seeking his third consecutive Player’s Championship appearance in Salt Lake City. Alvarado has wins over every player in the top 10 and in his 41st year is always a threat in every match against any player. 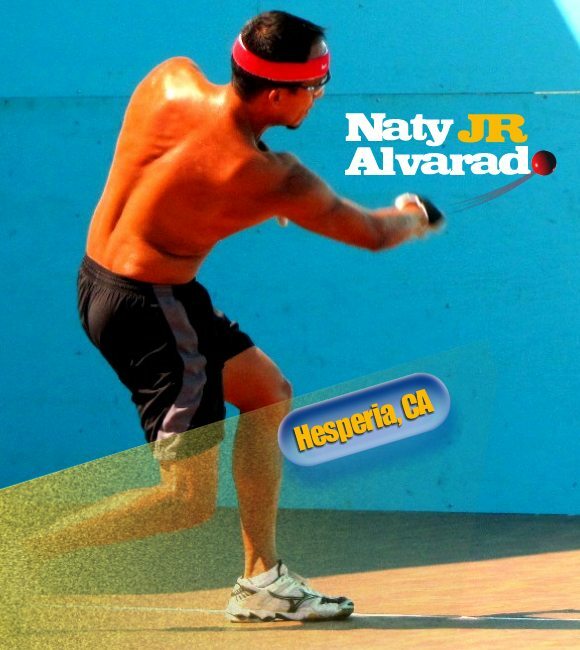 Naty Alvarado Jr. has proudly, humbly and honorably carried on the Alvarado handball legacy for over 20 years. Alvarado has been one of the most consistent and best handball players on the planet since the early 1990’s, reaching number one on the USHA Spalding/Gatorade Pro Tour in 2000 and ascending to number two on the WPH Race 4 Eight Tour in 2012.